Not many models of electric sweepers can be lighter than an average bottle of water. The OnTel Products SWSMAX is surely one maneuverable machine, with its almost 2 pounds of weight. Not only that it is suitable to be used by anyone, regardless of his/her physical condition, but storage becomes a piece-of-cake with this feature. 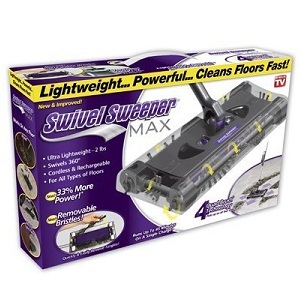 While its price is very low and anyone could afford it without famishing after purchasing it, this sweeper seems to lack durability, according to its reviewers. This doesn’t really come as a surprise, considering the weight and price of the sweeper, but not all buyers have expressed dissatisfaction. The OnTel SWSMAX sweeper is a cordless machine that allows you to carry it anywhere, without worrying the cord isn’t long enough and without always trying to get it out of your way. The fact that all the debris that is picked up goes to a specialized dust holder saves you from the trouble of buying extra trash bags, and the easy-release mechanism let’s you keep your hands clean at all times. What’s more, the brushes are removable for better cleaning, so you will get the same speed and thoroughness at every new use. This electric sweeper, despite it not having a suction feature, can sustain 4000 revolutions per minute, which is a fast way to dispose of any unwanted bits and pieces on your floor. This works with a standard 7.2V motor, and, in order to maximize the efficiency of its product, the manufacturer accompanies it with its own charger. To avoid interrupting your cleaning activity, the sweeper can be charged beforehand, and then simply used continuously for the whole 30-minute runtime. Due to some of its features, the OnTel SWS electric sweeper can be adjusted for use in many circumstances and environments. A flat-shaped head and low profile will help you navigate this machine on bare floors or furniture-packed rooms, around tables, chairs, couches and so on, with the same easiness and the same results. Furthermore, its ability to swivel at 360 degrees helps you deal with all kinds of surfaces in a sustained rhythm, since it won’t allow leaving any surface uncovered and will render easy maneuvering. One thing you will never ask yourself is if the OnTel SWSMAX that you bought was worth the money. There is no doubt that a swivel sweeper that is cordless and works for 30 minutes continuously, spinning its brushes at 4000 rpm, and costs under 50 dollars, is well worth its price. Buyers reports have underlined the fact that the battery has a rather short life, but there are still some ways to increase its durability, and with this model, you still have the option of replacing the parts for a very fair price. Overall, you get a very efficient cleaning tool for a small price and you have the advantage of being able to mend its intense-use related defects with a similarly small investment.